EFFECT and AFFECT are easy to confuse and often spelled wrong. The fact that the two words sound the same – they’re homophones – means people commonly mix them up. Here are my simple tips to remember the difference between EFFECT and AFFECT. AFFECT is a verb that means alter or influence. Think A for alter. EFFECT is most commonly a noun meaning the result of something. Think E for end result. That cheeky little ‘most commonly’ above? 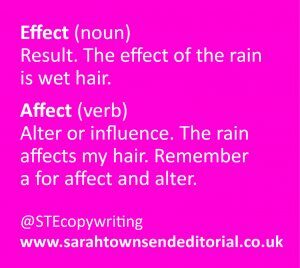 EFFECT can also, rarely be used as a verb, to mean ‘bring something about’. EFFECT as a verb is rarely written outside of formal English, so you’re fairly safe to assume you won’t need this spelling.